Your pepper spray makes you feel safe, right? Watch what happened when Jessica “Jai” McVay, former co-host of “Dawson McAllister Live,” used pepper spray for the first time. Pepper spray isn’t the only way to play it safe. Here are 24 safety tips plus more videos from Jai. Tell someone where you’re going. Let a friend know when you’re on your way and check in with a family member when you get there. Plan your travel accordingly. Know where you’re going and how you’re getting there before you leave. You’ll feel more confident in navigating your route if you already know what it is. Walk quickly and confidently because confidence is a deterrent. Attackers prefer their victims weak. The more inconvenient you become for an attacker, the less likely they are to make you their target. Always carry your cell phone and make sure it’s fully charged before leaving the house. A cell phone with a dead battery won’t help you in a time of crisis. Carry a whistle and keep it handy in case, Heaven forbid, you’re attacked. The noise will alert others you need help, which then scares off your attacker. Get one of those small, but bright, flashlights that fits on your keychain. It’ll help you see better when it’s dark, and help you feel more confident. Carry pepper spray, if it’s legal where you live. It takes practice to use correctly so spend time getting comfortable with it. Learn how to lock and unlock the safety switch quickly. 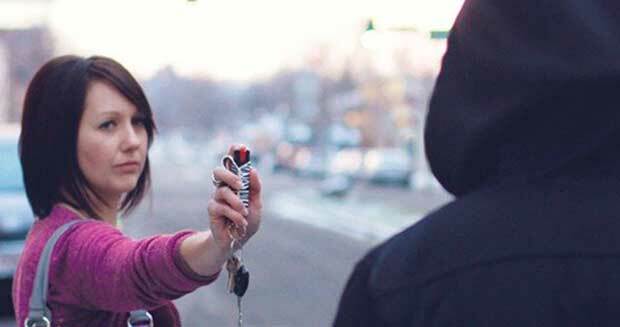 Pepper spray can be helpful, but there’s also a chance your attacker has the ability to grab it and use it against you. Be aware of your surroundings. Look around and pay attention to what is happening around you, who is around you. Don’t wear headphones or earbuds or clothes that hinder your vision like hoodies when you’re out by yourself. You can’t be alert to your surroundings is you’re tuned out of your surroundings. Stick to the well-lit areas. If you feel uneasy, call a friend or family member to stay on the phone with you until you’re safe. Just make sure you don’t get too distracted on the phone that you become unaware of your surroundings. If you notice someone may be following you, cross the street. If they cross, cross the street again. If they follow you across again, RUN and get into the nearest store, restaurant or better yet, police station. See what happened when Jai was being followed. If there’s a shady vehicle next to the driver’s side of your car, don’t hesitate to get in the passenger seat, lock the door and crawl over. If the situation seems pretty sketchy, go back inside where you were and find help. When you’re at events, always keep alert to your surroundings and take notice of the exits. Never leave your drink unattended and be careful of who you’re out with. Not everyone has the best intentions and not all predators are strangers. Don’t be alone with someone who’s drunk or under the influence of drugs. Don’t leave with anyone you don’t know. Drinking and doing drugs hinders your decision making ability and diminishes your ability to be alert to your surroundings. If you’re lit, you can’t protect yourself. Don’t leave an intoxicated friend in any potentially dangerous situations. If your friend is intoxicated, they won’t be able to protect themselves should a situation arrive. Don’t get in a car with a driver under the influence. A less drunk driver is still a drunk driver. Don’t hitchhike, or pick up a hitchhiker. Carry your keys in hand when walking. It keeps them handy for when you get to your home or car, so you can get into a safe space as soon as possible. Trust your gut. If something feels sketchy, or off, don’t feel embarrassed about leaving and getting to safety. Better safe than sorry. Attend a self-defense class in your area. It’ll improve your street awareness, teach you moves to ward off an attacker and help you develop a fighters reflex so you can get to safety. Staying safe starts with being prepared, and following a few simple tips could possibly save you from a pretty traumatic, or deadly, experience. How do you and your friends help each other stay safe?